Cobblers boss Dean Austin has appointed Andy Todd as his assistant manager. The former Town loan defender has been number two at Blackpool for the past two seasons, but quit the role last week for family reasons, with Todd wishing to be relocated to a job nearer his family. Alongside Gary Bowyer, Todd helped the Seasiders to promotion from Sky Bet League Two in 2017 and then played his part as the north west club held their own in league one last term. He has also previously held down the assistant manager role at Linfield, under Warren Feeney, and he followed the Northern Irishman to Newport County in January, 2016, to be his number two when Feeney took over the top job at Rodney Parade. The pair were sacked in September, 2016, but Todd was quickly snapped up by Bowyer, and the pair enjoyed success at Bloomfield Road. The son of former England international and Derby County legend Colin, Todd enjoyed a long playing career, and was on loan with the Cobblers for a six-week spell in the 2008/09 season under Stuart Gray, making seven appearances in the claret and white. Todd started his career at Middlesbrough, before going on to play for Swindon Town, Bolton Wanderers, Charlton Athletic, Grimsby Town, Blackburn Rovers, Burnley, Derby County, Perth Glory in Australia, Oldham Athletic and Hereford United, where he finish his career in December, 2011. In all, Todd made 313 starts and 62 substitute appearances in senior football in England. 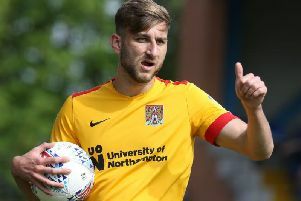 The 43-year-old starts work in his new job today (Monday), with the Cobblers squad reporting back for pre-season training ahead of the new campaign, which gets under way on August 4. The players will undergo fitness tests at the PTS Academy Stadium on Monday, before getting stuck into training proper on Tuesday morning at Moulton College.